I drew this comic after seeing Kiss in Dublin on the 7th of May. This will give you some idea of the back log of comics I have that are yet to be coloured and posted. 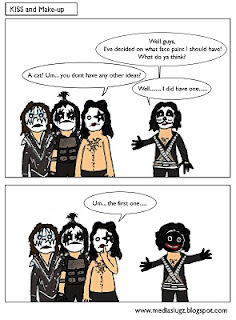 Every one has always made fun of Peter Criss for painting his face like a cat. What people don’t know is that ‘Catman’ was not his first choice. It was 1973 so you could just about get away with that kinda thing but being the shrewd business people that they were they decided against his first choice as they knew that it might be difficult to sell gollywog t-shirts and action figures in the future.